Discussion in 'The Pub' started by 84superchamp, May 6, 2016.
in honor of the Kentucky Derby tomorrow, what if a HD EG lined up in the gates with the horses and ran through the dirt (and maybe mud), could the HD take home the roses? would it not stand a chance against the sure-footed race horses? Not an EG, but these guys would smoke 'em. Shiro and CRAIG4FSU like this. yessir. but a big ol' road bike is a whole new ballgame..good acceleration but slow thru the turns. If the HD has street tires my money is on the horse. Which one is the Incredible Hulk riding, horse or Harley? 84superchamp and bushitsuki like this. I'd put my money on Cal Rayborn or Mert Lawwill on the hog. i'm guessing a high-strung race horse wouldn't let The Hulk anywhere close so...Harley. Maybe. Tell that to Jake Zemke and Rick Miller. race horse top speed 40+ MPH in derby race. 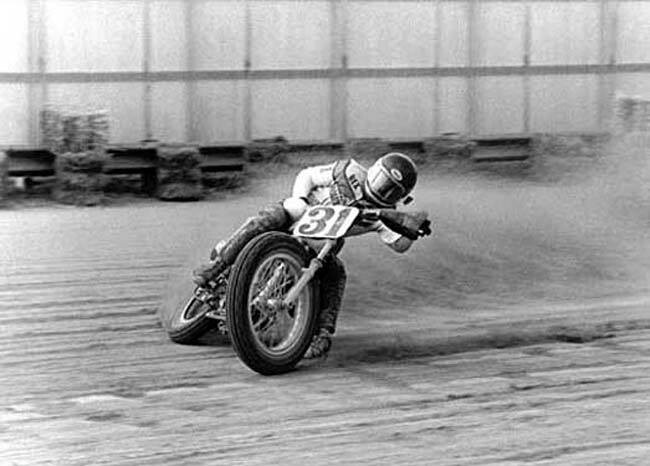 At our local speedway tracks they usually have a Harley race between the heats and the mains... and most of them are in the dirt before the backstretch. i think "grip" has more to do with it than top speed. Electraglide is a boat. A big, goofy boat. i "liked" it but neither is an electraglide. running boards, full fenders, engine guard, all manner of things to keep you from leaning too far. Is the track dry or muddy? Dry, Hog for sure. Muddy? 50/50 there. true (except EG floorboards are bolted in place) and if you remove the engine guard, go ahead and pull the fenders, take the saddlebags off, along with the fairing. but it isn't an electraglide anymore. The floor boards are bolted? That's just dumb. Why is Harley so dumb? i guess they just have so many loyal riders that they think dumb will do it? but my experience is the hard bags or bag guards will drag before the floor boards, and anybody who wants to really lean in the turns won't buy a bike with a touring frame.